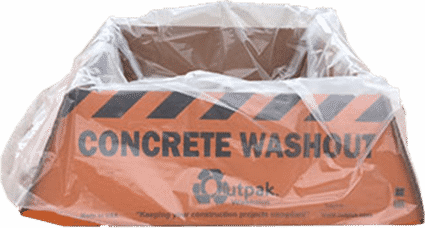 Outpak products are designed to be a portable, EPA-friendly solution for containment of hazardous construction site washout material such as: concrete sediment, paint, drywall mud, stucco, and mortar. 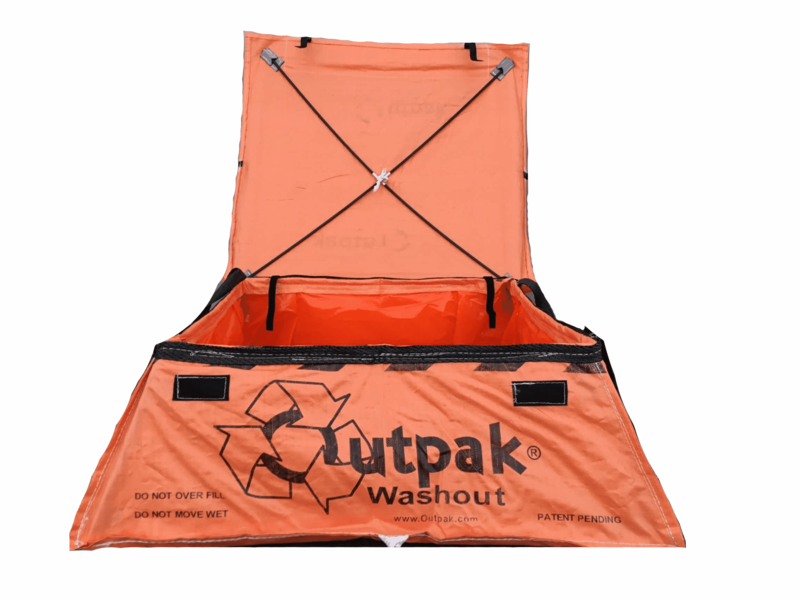 Our Corrugated Washout is portable, easy to setup, and cost effective. It is made from heavy-duty, 350# VC3 water-treated Kraft fiberboard so that it is light and durable yet folds flat for easy transportation and storage. The heavy-duty, water-treated, Kraft fiberboard that our corrugated washout is made from is durable enough to be left outside in the elements for the duration of short- to medium-term projects. If rain is expected, the poly bag can be tied closed so the washout material won’t take on additional water and extend the evaporation time. 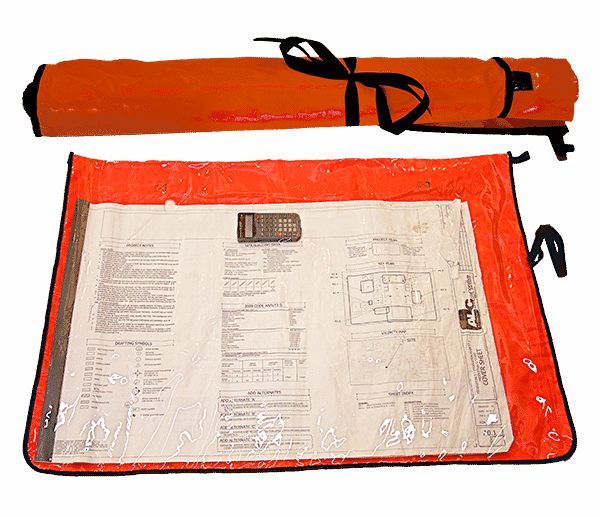 It is designed to be a portable, EPA-friendly solution for containment of hazardous construction site washout material such as: concrete sediment, paint, drywall mud, stucco, and mortar. At a job site, the last thing you want to worry about is setting up a complicated washout for equipment and tools. Our Corrugated Washout is the simplest washout on the market. Its patented folding design allows it to be stored flat, stored in the cab of a mixer truck, or strapped to the outside for quick deployment. Our new All-Weather Washout is designed to stand up to the toughest of environments while maintaining its portability, ease of setup, and cost effectiveness. It is made from heavy-duty, woven poly propylene that shrugs off the worst of climates but is still light weight and durable. It includes 5 to 1 safety rated lifting straps and folds flat for easy storage. A 6’x6’ detached rain fly is available if desired, which can be used with the All-Weather and Corrugated Washouts. 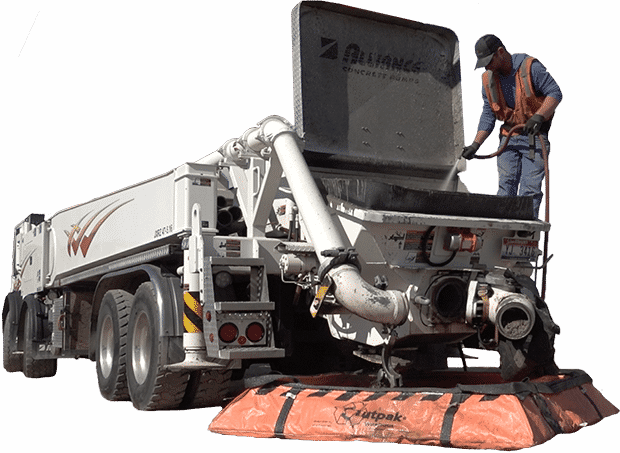 It is designed to be a portable, EPA-friendly solution for containment of hazardous construction site washout material such as: concrete sediment, paint, drywall mud, stucco, and mortar. At a job site, the last thing you want to worry about is setting up a complicated washout for equipment and tools. Our All-Weather Washout, like our Corrugated Washout, is simple to deploy but can sit on your job site through the duration of your project and the worst weather you can encounter. Its patent pending folding design allows it to be stored flat in the back of a pickup truck or strapped to the side of a mixer or pump truck. Our PVC washout is a cost-effective, portable, and extremely durable washout solution for large applications. It is more weather tolerant and has greater capacity than our corrugated washout products. Outpak’s PVC washout was designed to accommodate the larger volume of concrete wastewater generated when rinsing multiple mixers or pump trucks. If you have a large construction project and need a washout that will sit for months at a time in harsh weather, our PVC washout fits the bill. The strong 10-ounce PVC fabric is UV- and weather-resistant, which means it has a longer life on the job site. Our 6’ x 8’ PVC washout has twice the capacity of our large corrugated washout and can accommodate up to 2 cubic yards / 403 gallons. The largest washout unit we currently produce is the 8’ x 10’ PVC washout. It has a capacity of 3 cubic yards / 605 gallons. Outpak Slurry Solution is specifically designed to help you save time, money and labor at your job site. Our innovative product makes your slurry waste cleanup easier to manage and much more efficient. 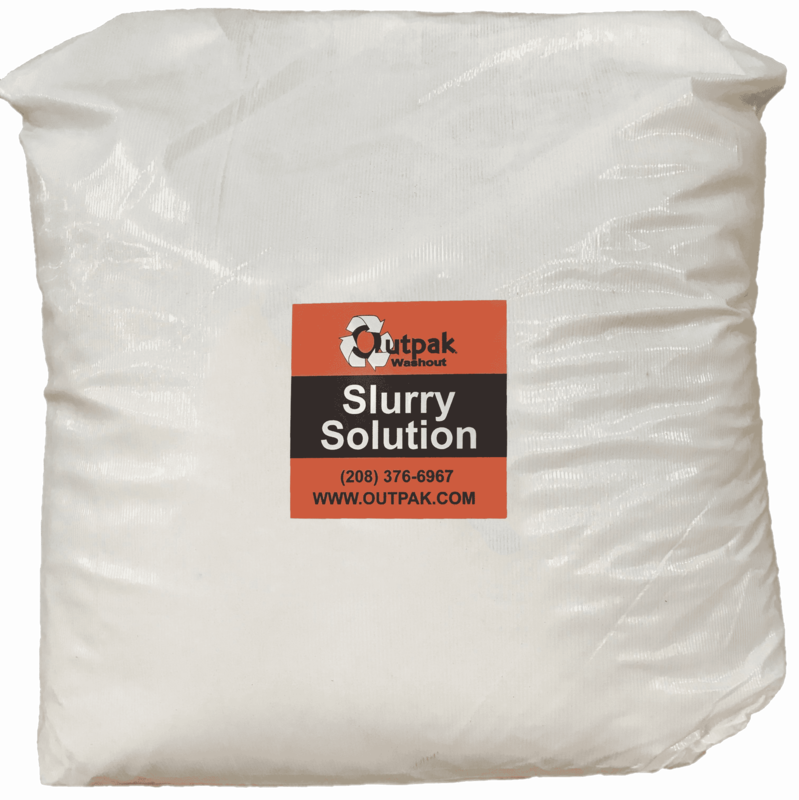 Just mix Outpak Slurry Solution into the slurry waste, wait a few short minutes for it to solidify and then you will easily be able to throw it away in any standard waste container. The material becomes EPA compliant and landfill ready. It’s a win for our environment, and with all the time and effort you will save it is definitely a win for your business as well. Our Slurry Solution comes in the following packages: Four, 7 lb. bottles per box / Four, 7 lb. bottles per box, 18 boxes per pallet / 50 lb. bag in case. 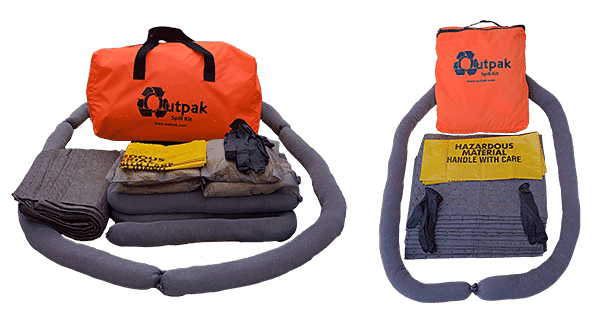 Our Outpak Spill Kits are universal spill kits; good for hydraulic oil, fuel, and radiator spills. They are compact and can be conveniently stored behind, or under the seat of your truck. 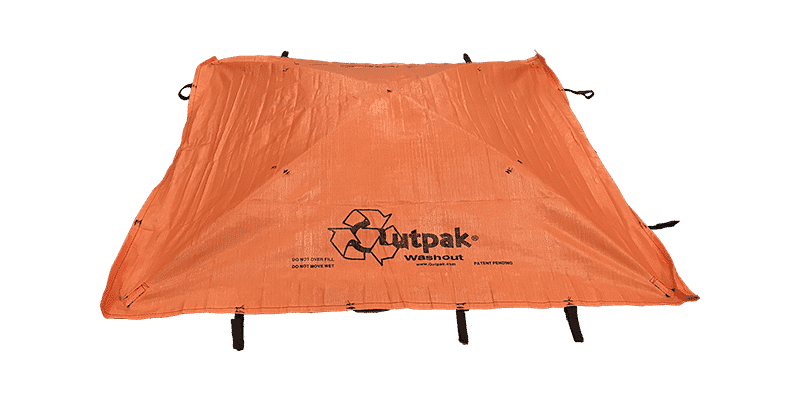 Outpak Plan Bags are an affordable way to keep your blueprints and construction plans free from the wind, dirt, mud, and moisture common to outdoor construction sites. Outpak Plan Bags are made from a durable 20oz PVC to guarantee a long life of the product. The bag has sleeves for no. 4 rebar to keep them flat in windy conditions. They also have tabs to hang from a wall for easy display. Please enter a city, state, or zip to find distribution locations within the desired range. Outpak Washouts and Outpak Slurry Solution are now available at Sherwin Williams stores!